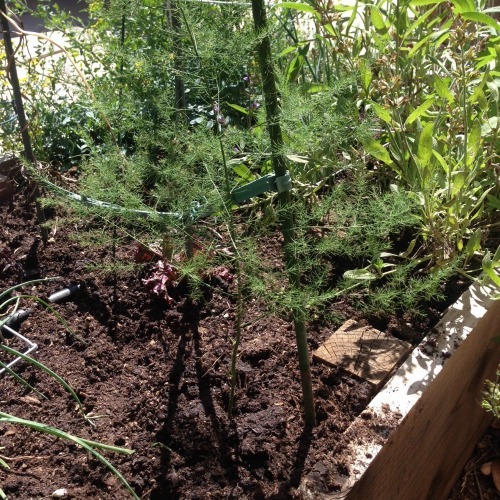 Home » Gardening » Raise Your Spear, Asparagus is Here! This earth day, visit your local farmer’s market and try some new vegetables, like asparagus, artichokes, swiss chard, green beans, spinach, and rhubarb. Asparagus is one of my favorites. Asparagus is a member of the lily plant family, and a nutritionally dense vegetable. It is high in nutrients that are important for YOUR body like, folic acid, vitamin C, and selenium. Asparagus can take 2-3 years to get established in your garden, but once it does you’ll have spears for 20 plus years. See my asparagus growing below it’s about 11 months old. Lightly brush with a mix of olive oil, salt, pepper, and herbs and spices and roast. I like 21 Salute by Trader Joes. Or try lemon pepper, salt and an herb blend mix. Cook in oven for 7 to 10 minutes on 400 degrees – asparagus should remain bright green with a slight crunch. Eat whole as a side or enjoy with sliced hardboiled eggs – my favorite! When it’s hot, steam until bright green, then chop it into a fresh green salad topped with lemon juice, olive oil, and other seasonings. In a time crunch microwave for 5 –7 minutes, and enjoy with a refreshing dill dip. Serve veggies before meals! Cold asparagus is an easy finger food. « Green Garbanzo Beans, Lentils and Veggies! 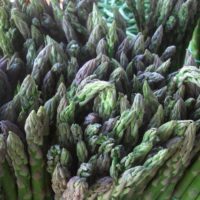 Comment on Raise Your Spear, Asparagus is Here!